Eosinophils are a type of blood cells which helps to fight off certain infections and participates in the body’s immune reactions. 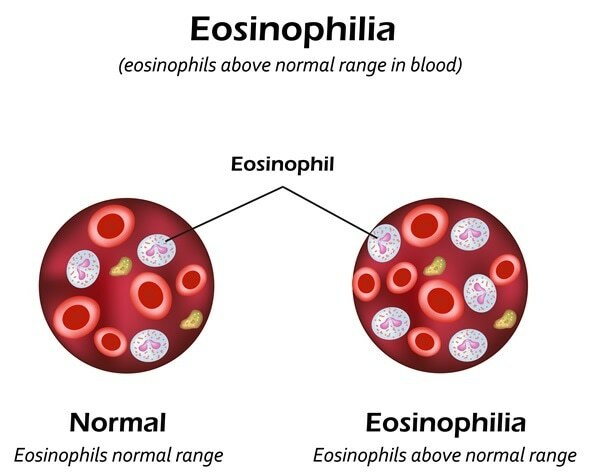 Eosinophilia is a condition in which the peripheral blood contains an excessive number of eosinophils, more than 500/µL. It may be classified into mild (500-1500/µL); moderate (1500-5000/µL); and severe (over 5000/µL) eosinophilia. Eosinophilia is termed primary or secondary, with respect to its causation. Primary eosinophilia is further classified into clonal eosinophilia, in which there is bone marrow proliferation, and the idiopathic type, which is a diagnosis arrived at when there is no evidence of either clonal or secondary eosinophilia. There is a set of rare disorders characterized by eosinophilia above 1500/µL persisting for at least 6 months, associated with organ dysfunction, but without other identifiable causes, called the hypereosinophilic syndromes (HES). Certain tumors, such as Hodgkin’s disease, also result in eosinophilia. Almost all invasive parasite infestations result in a rise in the number of peripheral blood eosinophils, such as ascariasis. Skin disorders due to hypersensitivity reactions such as pemphigus show associated eosinophilia. Syndromes of pulmonary eosinophilic infiltrate with eosinophilia are also rare causes, such as Churg-Strauss syndrome. Other conditions such as liver cirrhosis also show eosinophilia. Eosinophilia may be completely asymptomatic, especially with counts below 1500/µL.However, with markedly high counts, organ damage may occur. 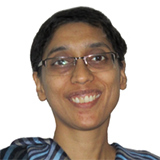 On the other hand, secondary eosinophilia may be associated with symptoms of the underlying conditions. Allergic reactions are associated with a raised eosinophil count, slight at first but increasing with each exposure. Mast cells and basophils associated with a hypersensitivity reaction produce and release a number of cytokines, which evoke IgE production. IgE, in turn, stimulates eosinophil production. IL-5 is a chemokine that is extremely important in the final differentiation of mature eosinophils, as well as their recruitment into sites of inflammation, and their prolonged survival. In addition, eosinophils produce growth factors which are responsible for the fibrotic response to inflammatory injury in affected tissues. 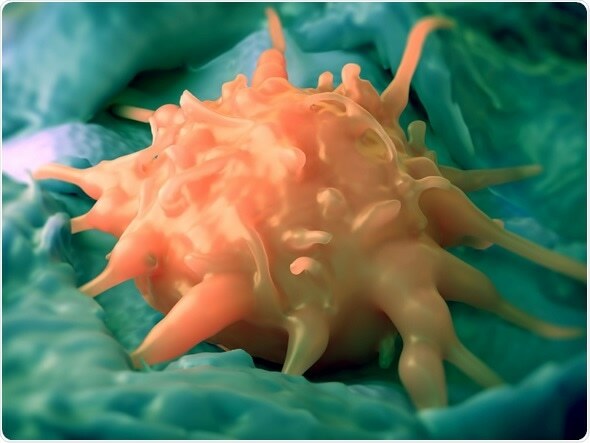 This is because the eosinophils release cytokines which not only induce inflammation, but also attract more eosinophils and other immune cells of various types to the organ site. The release of various chemicals and reactive oxygen species by the eosinophils and other cells creates more tissue damage.